This tutorial enables you to get a feel for HDF5 by using the HDFView browser. It does NOT require any programming experience. Download and install HDFView. It can be downloaded from the Download HDFView page. 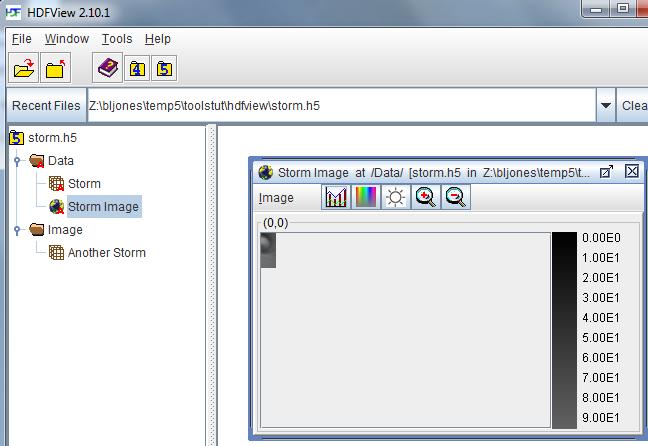 Obtain the storm1.txt text file, used in the tutorial. Once you have HDFView installed, bring it up and you are ready to begin the tutorial. Following are the topics covered in the tutorial. The first topic creates the file that is used in the subsequent topics. The steps below describe how to create a file (storm.h5), group (/Data), and a contiguous dataset (/Data/Storm) using HDFView. A group is an HDF5 object that allows objects to be collected together. A dataset is an array of data values. A contiguous dataset is one that is stored as a single block in the HDF5 file. Select the File pull-down menu at the top left, and then select New -> HDF5. Specify a location and type in storm.h5 for the name of your file, and click on the Save button. you will see a "5" folder icon in the tree view, followed by the name of your file, storm.h5. At this point you have an empty HDF5 file that contains nothing but the root group, "/". Right click on storm.h5, and select New -> Group . Enter Data for the name of the group and then click the Ok button. In the tree view you will see the folder (group) Data under the storm.h5 file. The path to this group is /Data. Right click on the group Data and select New -> Dataset. Left click on the Data group in the tree view. You will see Storm listed under the group Data in the tree view on the left. The path to Storm is /Data/Storm. 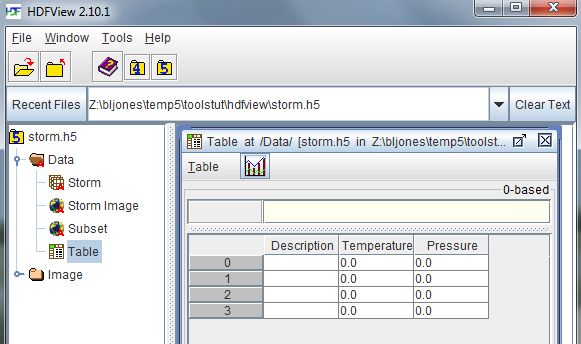 Double left click on the Storm dataset in the tree view. A window with an empty spreadsheet pops open. Copy the data from the storm1.txt file into the dataset. If you downloaded storm1.txt, then right click on the Table menu and select Import Data from Text File. Specify a location, select storm1.txt and click on the Open button. Answer Yes in the dialog box that pops up (which asks if you wish to paste the selected data). Alternately, you can copy/paste directly. Select and copy the data in a separate window. Position your cursor at (0,0) in your table, and select Paste from the Table menu. Data values will be added to the spreadsheet for the dataset. Close the dataset, and save the data. Any dataset can be viewed as an image in HDFView. Below are the steps that demonstrate this. Right click on Storm in the tree view, and select Open As. Select the Image button under Display As (near the top) in the Dataset Selection window that pops up. Then click OK at the bottom of the window. image larger and smaller with these buttons. The rainbow icon brings you to the Image Palette window. Click on that to play with the palette (GrayWave probably is the best choice). Close. Additional information to describe an object can be stored in attributes. An attribute can be added to a group or dataset with HDFView. Click on the /Data folder in the tree view. You will see two tabs, Object Attribute Info and General Object Info, in the pane on the right site of the HDFView window. With the left mouse button, select the Add Attribute button. Select the Ok button. The attribute will show up in the Properties window. Left mouse click on the /Storm dataset in the tree view. You will see the Object Attribute Info and General Object Info tabs on the right. Select the Ok button. The attribute will be displayed in the window. Notice that a scarlet letter A is attached to both the group and dataset in the tree view on the left. This indicates that there is at least one attribute attached to the object. A chunked and compressed dataset can be created using HDFView. A compressed dataset is a dataset whose size has been compressed to take up less space. In order to compress an HDF5 dataset, the dataset must be stored with a chunked dataset layout (as multiple chunks that are stored separately in the file). Please note that the chunk sizes used in this topic are for demonstration purposes only. For information on chunking and specifying an appropriate chunk size, see the Chunking in HDF5 documentation. Also see the HDF5 Tutorial topic on Creating a Compressed Dataset. Right click on storm.h5. Select New -> Group. Enter Image for the name of the group, and click the OK button. Right click on the Image group, and select New -> Dataset. The dataset gets created and will show up under the Image folder in the tree view on the left. Its path is: "/Image/Another Storm"
Double left-mouse click on the Another Storm dataset. A spreadsheet window will pop up on the right side of the screen, containing zeroes. Close the table, and save the data. Right click on Another Storm, and select Open As. Select the Image button in the Dataset Selection window that pops up. Click the Ok button at the bottom of the window. You should see an image in the window that pops up on the right. A previous topic demonstrated how to view any dataset as an image in HDFView. With HDFView you can also create an image to begin with, as is shown below. Right click on the Data group and select New -> Image. Double left-mouse click on the Data group to see its contents. You will see Storm Image listed with an "earth" icon to the left of it, indicating an image. 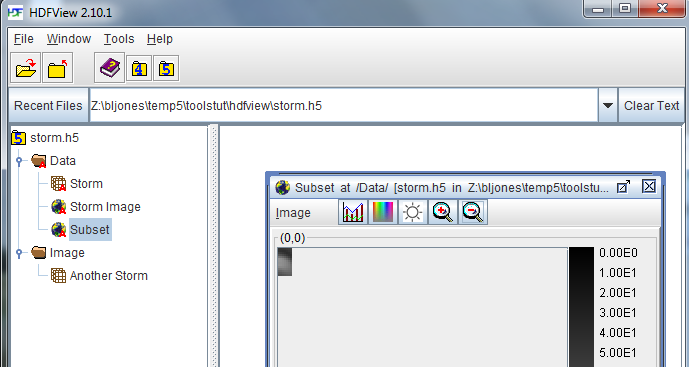 Right click on Storm Image, and select Open As to open the Dataset Selection window. Click on the Spreadsheet button at the top left of the Dataset Selection window to view the image as a spreadsheet. Close the dataset and save the data. Left double click on Storm Image to see the image. Close the dataset. 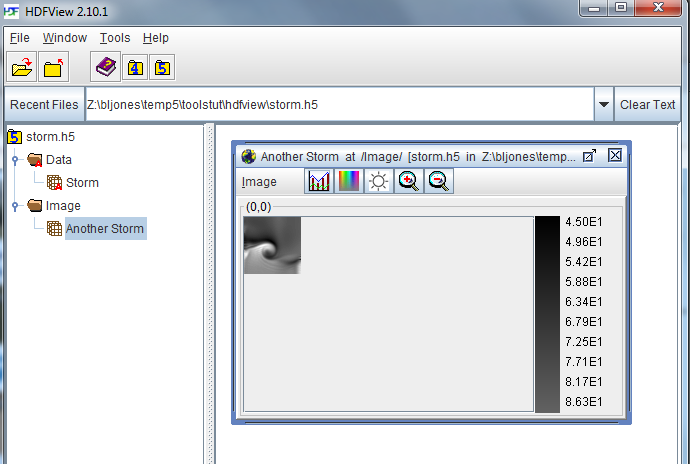 Right click on Storm Image and select Show Properties from the pop-up menu, to open the Properties window. Select the Attributes tab. In the Properties window you will see an attribute called CLASS. This attribute indicates to HDFView that the dataset is an image. See the HDF5 Image and Palette Specification for further information. 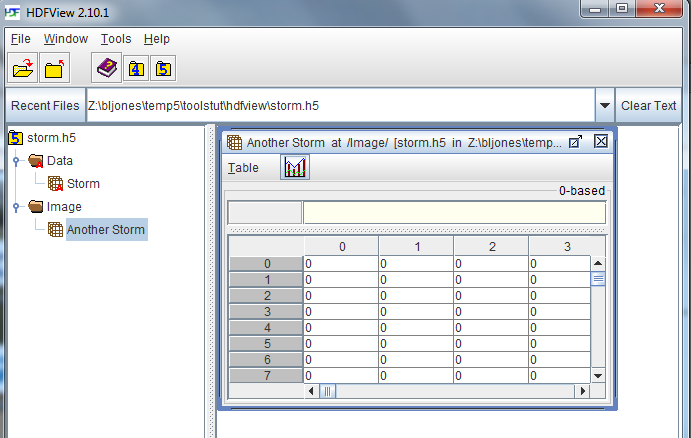 Right click on Storm Image and select Open As to bring up the Data Selection window. Select a subset by clicking the left mouse on the image in the window and dragging the mouse. Notice that the Height and Width values change. Select to display it as an image. Click Ok.
A window pops up with the selected portion of the image displayed in it. Position the cursor in the middle of the image. Press Shift+Left Mouse button and hold, and then drag the mouse to select another subset. Select Image->Write Selection to Image. Enter Subset for the new image name. Click Ok. The Subset image will appear in the tree view on the left. Left double click on the image Subset to bring it up on the right. The very small Subset image is displayed on the right side of the HDFView screen. A dataset with a compound datatype contains data elements that consist of multiple fields. If the dataspace for the compound dataset is one-dimensional, then the dataset can be viewed as a table in HDFView, as is shown below. Right button click on the group Data. Select New -> Compound DS. The window for creating a compound dataset is shown below. Open the Data group (if it is not open) and double left click on the Table object. The dataset will open in a window on the right. The fields in the dataset have no values written to them.